Jonathan writes for film, stage, TV, radio and animation. His first play was commissioned by the Oxford Playhouse Company (MAKING A DIFFERENCE) and he has since written stage plays for fringe, rep and the National Theatre (DIARY OF A NOBODY). As a film-writer, he was commissioned to write MALLORY and a feature version of THE TAMING OF THE SHREW, both for Damian Lewis (co-producing and starring) and Amber Entertainment. He has also written episodes for TV series such as THE BILL, EASTENDERS and HOLBY CITY. THE CANTERBURY TALES (HBO/S4C) was his first animated film – he was Nominated for an Oscar and went on to win a BAFTA, four EMMYs and many other awards worldwide. He has written over forty original plays for radio and created the series NUMBER 10 for BBC Radio 4 which won the 2010 Writers Guild Award for Best Radio Drama. His adaptation of Vasili Grossman’s LIFE AND FATE was the centrepiece of R4’s Autumn 2011 season. Recent radio dramas include THAT WAS THEN (returning for a second series soon), the 3 play series THE CLINTONS broadcast August 2016, REYKJAVIK and HOW DID I GET HERE?, all Afternoon Plays; three plays in THE PRICE OF OIL season; BORN IN THE DDR, a Saturday Play; a dramatisation of Walter Scott’s TALISMAN and THE RESERVE ROPE, both for Brill Productions/BBC. He is the author of two novels – NOISE and YOUR FATHER – both published by Headline Review. A frequent contributor to The Guardian, he also wrote a column about his experiences as a local councillor in Lambeth. 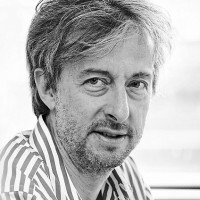 He is Director of the MA in Creative Writing at City University, London.